The White House today released details of the upcoming Trial of Republicans for Sedition, to begin on June 1. 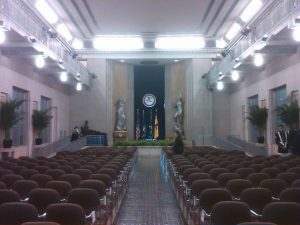 The Great Hall of the Robert F. Kennedy Department of Justice, from where so many momentous announcements have been made, has been selected as the Trial Courtroom for the prosecution of Republicans who aided, abetted and enabled the criminal presidency of the now-impeached President Donald J. Trump. Seated in the Chief Juror’s seat will be former Vice President Joe Biden, flanked by Associate Jurors Nancy Pelosi, George W. Bush and Hillary Clinton. The accused defendants are Donald J. Trump; his son, Donald Trump Jr., his son-in-law Jared Kushner, his chief spokesperson Sarah Huckabee Sanders, his Special Counselor Kellyanne Conway, Mitch McConnell, the former Senate Majority Leader, Paul Ryan, the former Speaker of the House, Gen. John Kelly, Trump’s former chief-of-staff, Mike Pence, the former Vice President, Stephen Miller, a former senior advisor to Trump, twenty former and current Republican Congressmen and women, and fifteen former and current Republican Senators, including Ted Cruz and Chuck Grassley. All are charged with various counts of defrauding the American public, sedition, treason, corruption, violating election laws, conspiring with a foreign power, and conduct unbecoming to an American official. The penalties they face range up to life in prison. The Chief Prosecutor will be former President Barack Obama, assisted by Harvard professor Laurence Tribe, Congressman Adam Schiff and N.Y. Governor Andrew Cuomo. Attorneys for the defense include Trump associate Alan Dershowitz, Fox News commentator Joseph DiGenova and former Senator Lindsay Graham. Rudy Giuliani, the former New York City Mayor, who was expected to be chief defense counsel, abruptly took himself out of consideration, after his disbarment last week. The Trial is expected to draw tremendous attention from the world’s media. The White House announced that 74 news organizations, from 56 countries, have registered for press credentials. All pending business of both houses of Congress, as well as major Cabinet departments, is likely to be put on hold, as observers from both parties gather around television sets to watch what is likely to be the Trial of the Century. At the center of it all is Trump. Since his Impeachment he has relentlessly proclaimed his innocence on all charges, attributing his prosecution to “the Witch Hunt of Angry Democrats, led by Hillary Clinton.” Dividing his time between Mar-a-Lago, his Florida estate, and his penthouse in Trump Tower, the former president has not been shy about appearing in public. Dinners at restaurants and golf are his pastimes of choice, often accompanied by one or more of his children, but seldom by former First Lady Melania Trump, who is said (by at least one entertainment outlet) to be considering divorce. Trump has aged visibly in the year since his Impeachment, gaining a considerable amount of weight, and growing his hair almost to shoulder-length. His favorite hangout in New York is Club Bimbo, on Broome Street, in Soho, a haunt of prostitutes, upper East Siders out slumming, and rich European heiresses—strange company for Trump, who seems to be reverting to his late 1970s-era Club 54 lifestyle. He has a reputation as a big tipper, a gladhander who knows everybody. But Trump still doesn’t imbibe alcohol. Those close to him suggest that a certain white powder occasionally finds its way up his nostrils, but there’s no proof of that, other than his night-owl hours. Club Bimbo has some good bands, but Trump has never been a dancer. He sits there in his favorite booth, watching benignly over the scene, a paterfamilias lording it over his clan. Every so often, a rumor circulates in his circle, to the effect that he likes to dress up in pantyhose and leather chaps, and there are the perhaps inevitable tales of water sports. But little is known of this side of Trump’s new life, except for the prostitutes, a known quantity for him. Some who know him say that he’s a different man now, chastened, more humble after the disgrace of Impeachment, and the looming possibility of jail time, not only for himself but for his family. He’s even been seen in St. Patrick’s Cathedral. But for the most part, Trump seems unrepentant, as angry as ever, determined to clear his name. He is not going away anytime soon—unless, that is, it’s to jail.